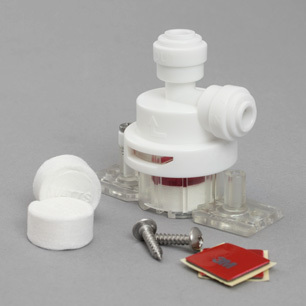 The leak protector comes with two replacement pads, two adhesive mounts and screws. This unique leak prevention system from Watts detects leaks and turns off the water supply when it detects moisture under the sink. It's a simple, inexpensive, fail-proof device that can prevent serious water damage. This inexpensive unit detects leaks in water filtration units and shuts off the water supply automatically when a leak occurs. Water is detected by a replaceable, water activated pad within the leak preventer. The pad expands to shut off water flow when water is detected. The Leak Protector is designed especially for undersink water filters and reverse osmosis units, but can be used in other applications such as refrigerator feed lines, water coolers or basement filter installations. The Watts Leak Protector is very easy to install, and the pads are replaceable. The only tool you'll need to install it is a pair of scissors. Best of all, no batteries or electrical connection are needed. To install the leak protector, simply attach it to the floor with a single screw at a place where water would likely accumulate in case of a leak, clip the 1/4" tube that supplies water to the filtration unit, and poke the ends of the tube into the protector. When even the smallest amount of water contacts the leak protector, its absorbent pad expands and shuts the inlet water off completely. The leak protector installs into 1/4" plastic tubing, the inlet tube size of most reverse osmosis units and undersink filters. 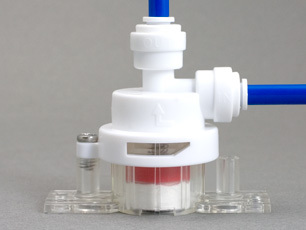 Adapters are also available for 3/8" water supplies — call for information about these adapters.